To print: Select File and then Print from your browser's menu. When NVIDIA launched the GeForce GTX 1080 back in May they set a new high bar for GPU performance. We're now in 2017 and NVIDIA unveiled last week at GDC the GeForce GTX 1080 Ti. Based on NVIDIA's GP102 GPU - Pascal - the GTX 1080 Ti is taking advantage of improved manufacturing yields and reduced costs to offer more power. With the GTX 1080 Ti, NVIDIA says it is offering around 35% higher performance compared to the GTX 1080. GTX 1080 Ti ships with 28 of GP102's 30 SMs enabled. Compared to the NVIDIA Titan X, which is also based on the same Pascal GPU, the GTX 1080 Ti has 88 out of the available 96 ROPs enabled. In terms of clockspeeds the GTX 1080 Ti ships with a 1.48GHz base clock and a 1.58GHz boost clock. This is a bit lower than the clocks the GTX 1080 shipped at 1.6GHz and 1.73GHz respectively. On the memory front, the GTX 1080 Ti is the first card NVIDIA is equipping with partner Micron's second-generation GDDR5X memory. This allows for higher clockspeeds, allowing NVIDIA to ship the GTX 1080 Ti with an 11Gbps memory clock, a 10% increase over the 10Gbps clock found on the Titan and the GTX 1080. This memory is situated on a 352-bit memory bus, which works out to 11GB of memory with a total bandwidth of 484GB/sec for the GTX 1080 Ti. The GTX 1080 Ti offers just over 11.3 TFLOPS of FP32 performance. This puts the expected shader/texture performance of the card 28% ahead of the current GTX 1080, while the ROP throughput advantage stands 26%, and memory bandwidth at 51.2%. The card's TDP is 250W. Besides the Founder's Edition, NVIDIA's partners will offer a mix of reference and custom designs by next month. The $699 MSRP of the card will be the MSRP for both the Founder's Edition and partners' custom cards. The GTX 1080 has in turn received a price cut, with the base cards going down to $499, and the Founder's Edition going down to $549. For now, the GTX 1080 Ti is facing no competition, until AMD releases its RX Vega video cards sometime in the next quarter. 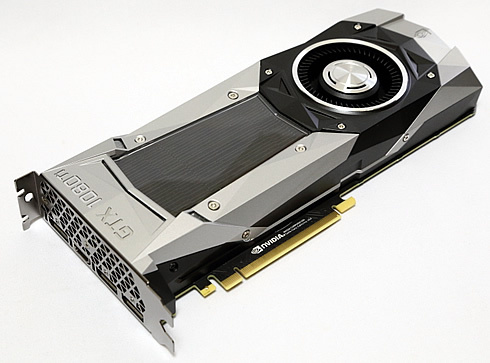 The GTX 1080 Ti Founder's Edition is a 10.5-inch type card comprised of a cast aluminum housing and held together using a combination of rivets and screws. 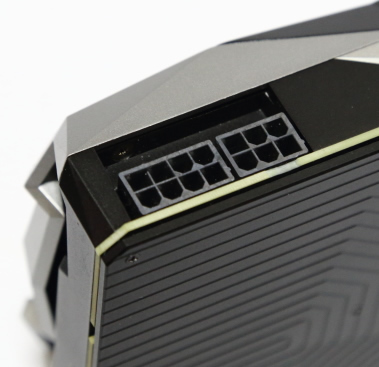 NVIDIA is lining the entire card with an aluminum baseplate, which provides heatsinking capabilities for the VRMs and other components below it, along with providing additional protection for the board. Like past NVIDIA 250W cards, the GTX 1080 FE uses NVIDIA's vapor chamber cooler in order to maximize the heat transfer between the GPU/VRMs/DRAM and the aluminum heatsink above. For the GTX 1080 Ti, NVIDIA has removed the DVI port that in past designs took up part of the second slot used for ventilation. Towards the top of the card we find the requisite SLI and power connectors. Like NVIDIA's 250W cards before it, the GTX 1080 Ti features a 6 pin + 8 pin setup. NVIDIA's display I/O configuration includes 3x DisplayPort 1.4 and 1x HDMI 2.0b. NVIDIA is also including a DisplayPort-to-SL-DVI adapter with the Founder's Edition card. 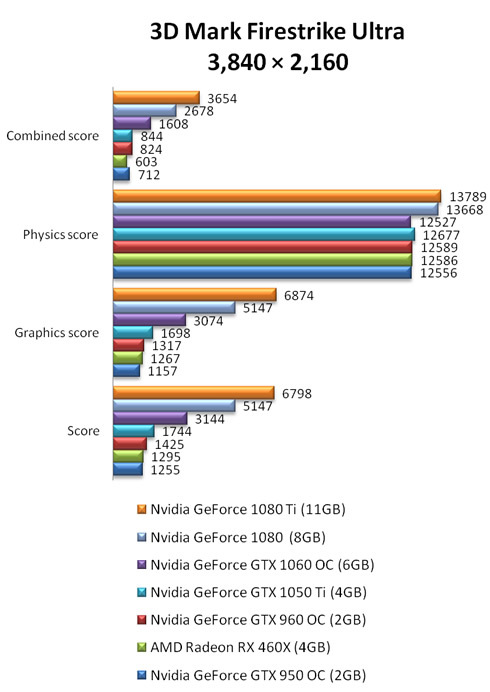 We begin with the test result of the 3DMark benchmarks. The GeForce GTX 1080 Ti's overall score is about 25% higher than the GeForce GTX 1080's in the "Time Spy" test under DirectX 12 at a resolution of 2,560 x 1,440 pixels. 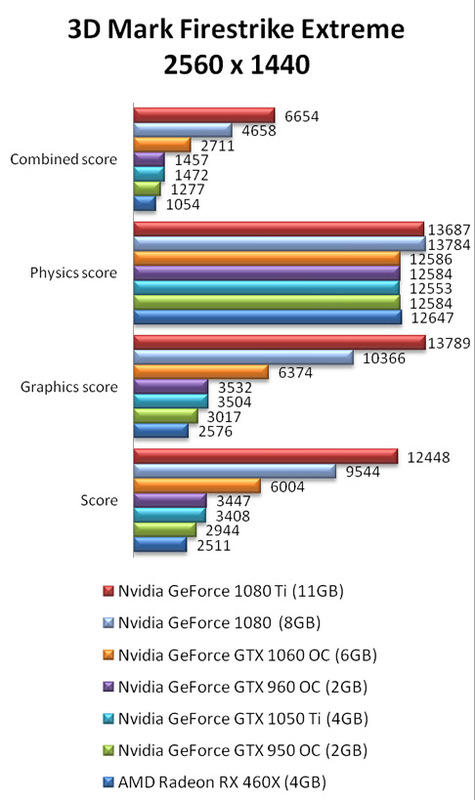 The Graphics Score controbuted significantly to the 1080 Ti's overall score - the card had a 32% lead over the GTX 1080. 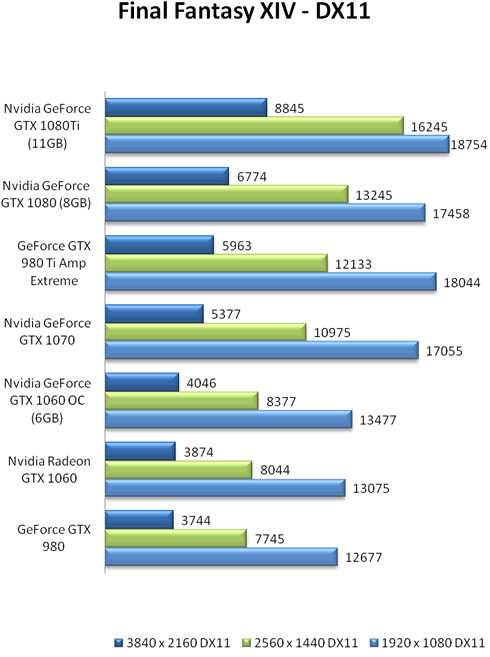 In the "Fire Strike" DirectX 11 benchmark, both the "Ultra" (3,840 x 2,160) and "Extreme" (2,560 x 1,440) results gave the GTX 1080 Ti a 30% lead in the overall score, over the GTX 1080. In the Fire Strike test under Full HD resolution (1,920 x 1,080), the difference in total score of the 1080 and 10880Ti GPUs was reduced to about 16%, and obviously the CPU acts as a bottleneck here. In "Sky Diver" and "Cloud Gate" becnhmarks, which pose a lower load to the GPUs comapred to the Fire Strike becnhmark, the score difference between the 1080s was further reduced at about 9% in Sky Diver, with both GPUs to perform equally in the Cloud Gate test. 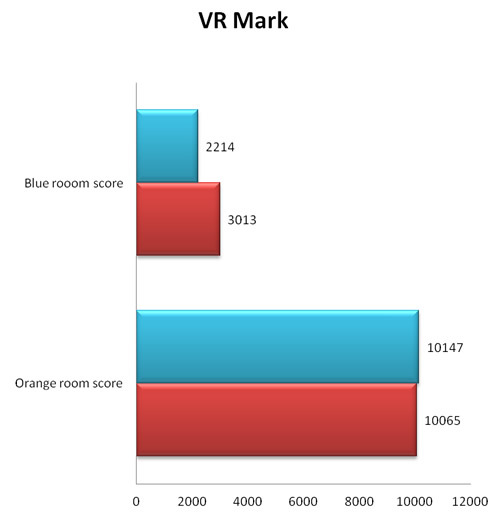 Futuremark's VRMark benchmark returns two tests - the "Orange Room" runs at 2,264 x 1,348 and the "Blue Room" tests the GPUs at 5,120 x 2,880. In the Orange Room test, the GeForce GTX 1080 gave a slightly higher score than GeForce GTX 1080 Ti. 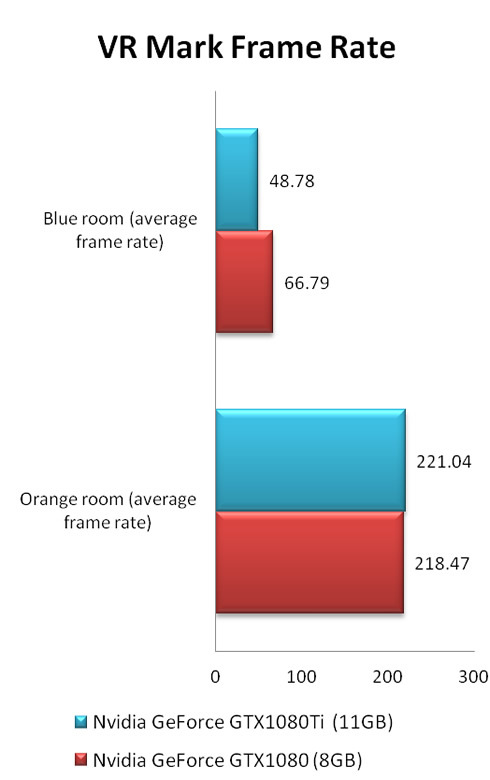 The average frame rate in the Orange Room is about 220 fps for both GPUs, which is twice the test's standard frame rate of 109 fps. How a weaker GPU scores better? Well, the CPU is becoming a bottleneck for the 1080Ti, as it happened at 3DMark's "Cloud Gate" test. In the Orange Room, which puts the GPUs under a ligher load, the performance of the CPU is insufficient cope with the higher frame rate as the GPU is running at full speed. Meanwhile, in the Blue Room test, the GeForce GTX 1080 Ti scored about 36% higher than the GeForce GTX 1080. Even at the average frame rate, the 1080Ti is about 38% higher. However, the Blue Room test is extremely demanding (5K) - even the GeForce GTX 1080 Ti cannot reach the target frame rate of 109 fps. We are moving on to the more demanding Final Fantasy XIV and at heavier load for the GPUs. The benchmark was run at resolutions of was executed full HD, WQHD and 4K, with the graphics quality set to max and under DX11 mode. The GTX 1080 Ti kept widening its performance lead over the GTX1080 GPU as we were moving to higher resolutions. 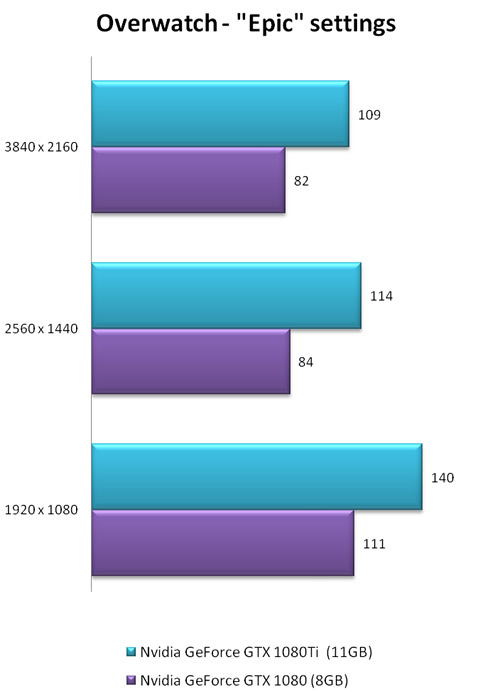 As you can see, the 1080Ti's was about 6%, 21% and 30% in the full HD, WQHD and 4K tests, respectively. In the Ashes of the Singularity game we set the graphics quality to the highest "Crazy" setting and run the test under full HD and 4K for both DirectX11 and DirectX 12 APIs. The advantage of GeForce GTX 1080 Ti in the Full HD test is about 6% for DirectX 11 and about 21% for DirectX 12. 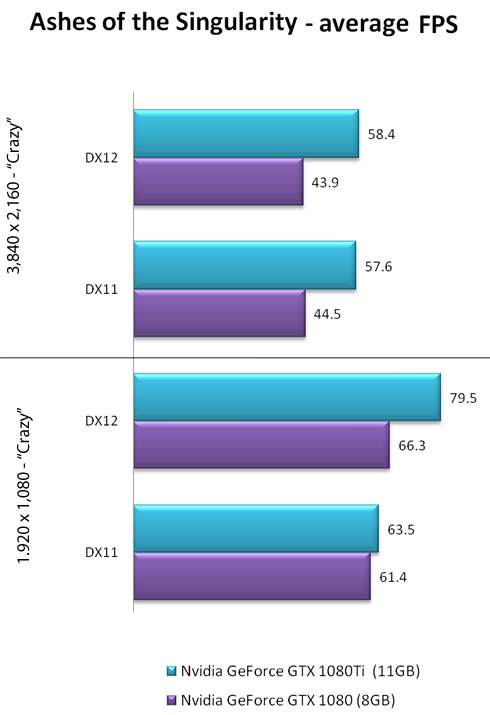 The result can be explained considering that the CPU bottleneck factor becomes lighter under DirectX 12. 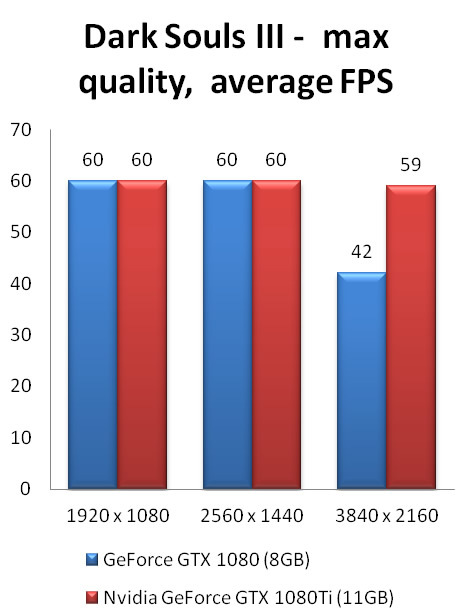 In the Overwatch FPS game we set the video quality to the highest "Epic" settings and again we measudered the average FPS for each card under different resolutions. Here the GeForce GTX 1080 Ti has a lead of about 29% for Full HD, 32% for WQHD and 30% for 4K. The potential of GeForce GTX 1080 Ti is fully demonstrated in the low resolution tests. 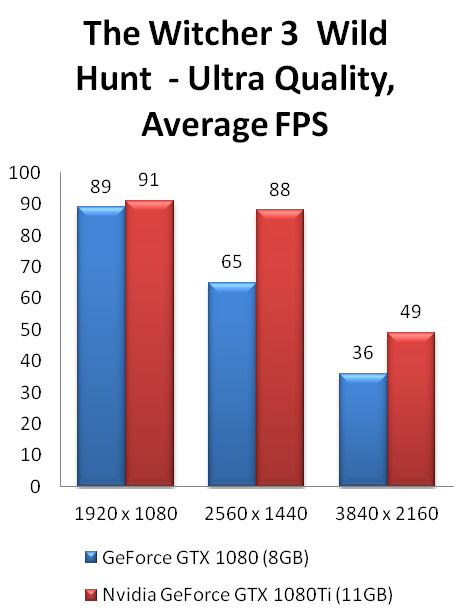 We measured FPS with The Witcher 3: Wild Hunt game, in Full HD, WQHD, 4K and with the graphics quality set to the highest allowed level. The frame rate recorded with the GeForce GTX 1080 Ti is 92fps for Full HD, 87fps for WQHD and 51fps for 4K. The difference with the GeForce GTX 1080 is about 2%, 30% and 34% for the aformentioned resolutions, respectively. Notice that even GeForce GTX 1080 Ti can not maintain 60fps under 4K and the highest rendering quality. In the Watch Dogs 2 game we set the video quality to "maximum" and measured the frame rates in various resolutions. Watch Dogs 2 poses a high GPU load under high quality settings, and it also requires high multithreaded performance from the CPU. As a result, both the 1080 and 1080Ti GPUs reached the maximum frame rate of about 60 fps in Full HD, and their difference in WQHD was very small at about 7%. 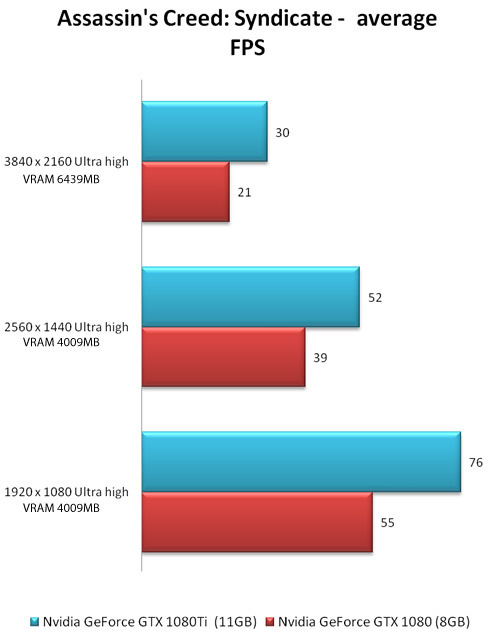 At 4K resolution, the frame rate of both GPUs was lower than the 60 fps. The GeForce GTX 1080 Ti recorded 44.3fps and the GeForce GTX 1080 gave 35.3fps. Given the capabilities of GeForce GTX 1080 Ti, it seems likely that the GPU can maintain 60 fps or more under WQHD, as long as you combine the GPU with a CPUs with high multithreading performance. If you want a comfortable Watch Dogs 2 play, you'd better get a 6-core CPU at least - up to 12 threads. Once again video quality for the Dark soul 3 to the highest level and measured fps in resolutions of Full HD, WQHD, 4K. The highest FPS allowed by this game is 60fps, so both the GTX 1080 and the GTX 1080Ti GPUs easily reached this limit in both Full HD and WQHD. Their difference appeared under 4K, with the GeForce GTX 1080 Ti to return the 59fps, which is about 34% higher than the 44fps of GeForce GTX 1080's. The Assassin's Creed syndicate remains a game title with a considerable GPU load, and in this test we selected the highest video quality preset. The GeForce GTX 1080 gave a smooth 57fps even at Full HD resolution, while the GeForce GTX 1080 Ti recorded 75fps under the same conditions. Overall, the GeForce GTX 1080 Ti exceeds the GeForce GTX 1080 by about 32% for full HD, 33% for WQHD and about 36% for 4K. However, the GeForce GTX 1080 Ti can maintain 60fps with the highest video settings enabled under Full HD, while the GeForce GTX 1080 can't. 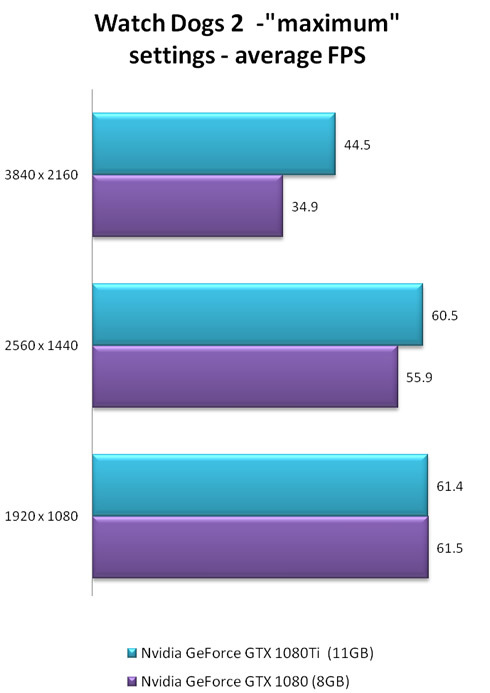 We measured the power consumption of the system during the benchmarks with each GPU. Both idle and maximum power figures we recorded. Our system's power consumption with the GeForce GTX 1080 installed under idle was 31W, and reached the 36W when we installed the new eForce GTX 1080 Ti. The peak power comsumption during our benchmarks reached the 260 W with the GeForce GTX 1080 installed, and was less than 340W when we measured the performance of the GeForce GTX 1080 Ti. So the GeForce GTX 1080 Ti was consuming about 30% more power. In terms of power efficiency and at full GPU operating speeds, both the GTX 1080 and the GTX 1080Ti seems to have the same power efficiency. However, in cases where the GPU was not working at full speed i.e when our system's CPU limited the provided fps (VRMark's Orange Room, Dark Soul 3), the GeForce GTX 1080 Ti was not power efficient at all. The GeForce GTX 1080 Ti proved to be 30% mode powerful than the GeForce GTX 1080 in terms of overal performance. 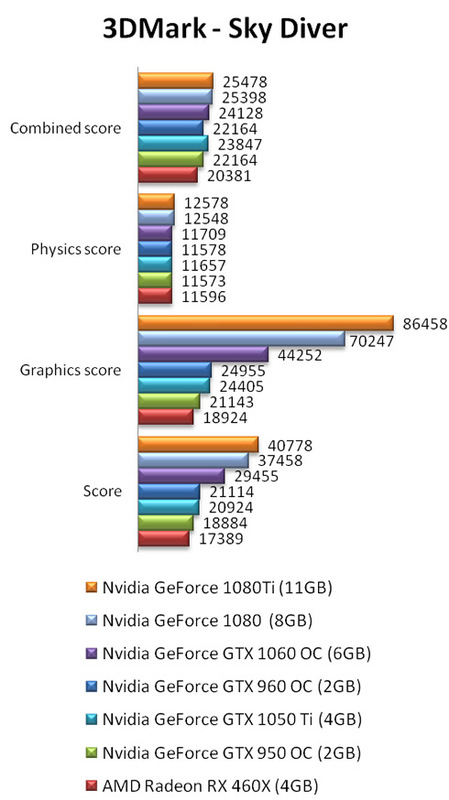 That's exactly what we could expect from a high-end GPU based on the GP 102 core. The card is also about 70% faster than the Nvidia GTX 980 Ti (4K). It can offer no-compromises 4K gaming and was the first card to crack 60fps at 4K in a few of very demanding games. Obviously the GeForce GTX 1080 Ti will be attractive to gamers, as it is currently facing no competition from AMD and will allow you to play at 4K. Priced at $699, it is certainly a more realistic choice for gamers who could not get their hands on an Nvidia TITAN. 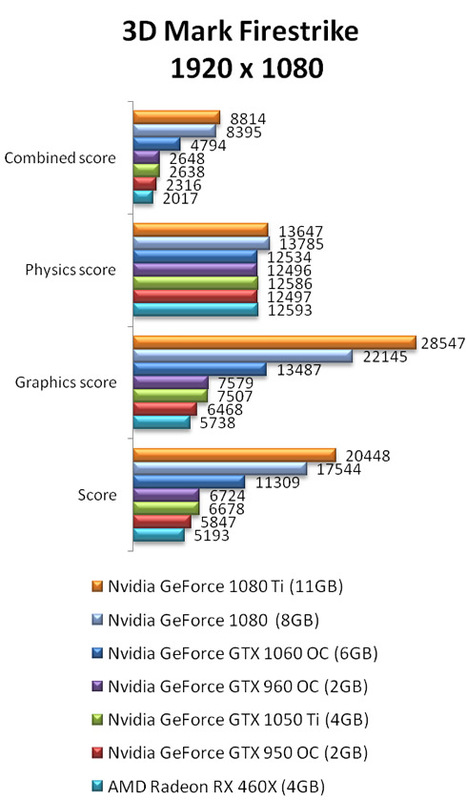 The GTX 1080 has gone unchallenged in the last months and the GTX 1080 Ti NVIDIA seems to be extending that performance lead even farther. We are waiting AMD's response with the Vega release later this year.